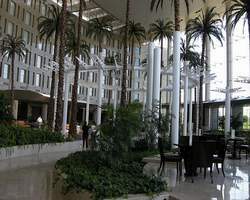 The Fairmont Heliopolis offers a convenient location just 5km from Cairo International Airport. Heliopolis is a tree lined suburb of Cairo that is home to Egypt’s Diplomatic and Presidential offices. The hotel is three miles from Tree of the Virgin and the Roxy shopping district. It is also six miles from Saint Marco's Cathedral and 12 miles from Egyptian Museum, the Pharaonic Village, Khan El Khalily (Old and Oriental Market), the citadel, and the Nile. Whether you’re traveling on business or pleasure, our spacious, well-lit 544 guest rooms offer all the comfort and services you’ve come to expect from Fairmont Hotels & Resorts. Looking for something truly unforgettable? Our elaborate suites allow you to entertain in style while still being able to enjoy a degree of comfort and relaxation previously unimagined. Savor all flavors of the world at the Fairmont Heliopolis Hotel. Eleven distinctive restaurants and lounges satisfy every appetite for great dining and entertainment. Experience mouthwatering Lebanese food in Al Dabke or authentic Italian dishes in Leonard. For an elegant dinner, join us at Chinois,our Asian restaurant, and enjoy fresh sushi in a warm atmosphere. My kind of place is an all-day dining restaurant with a wide selection of classic international food. Relax with snacks and soft drinks at Blue Lagoon. The Gourmet Shop is worth a visit with its Tasty chocolate selections. If you prefer to dine in the privacy of your own room, we also offer an extensive menu through our 24-hour room service. Below you will find a list of our dining options for Fairmont Heliopolis,Cairo. Experience the the splendor of Fairmont Heliopolis. The hotel features a wide range of facilities and personalized service for business and leisure travelers. Explore our fine dining options and other services.